Do you ever discover brands and then become completely obsessed and you know you just have to have everything (or at least one or two things) and then once you buy something you're not obsessing over it anymore? 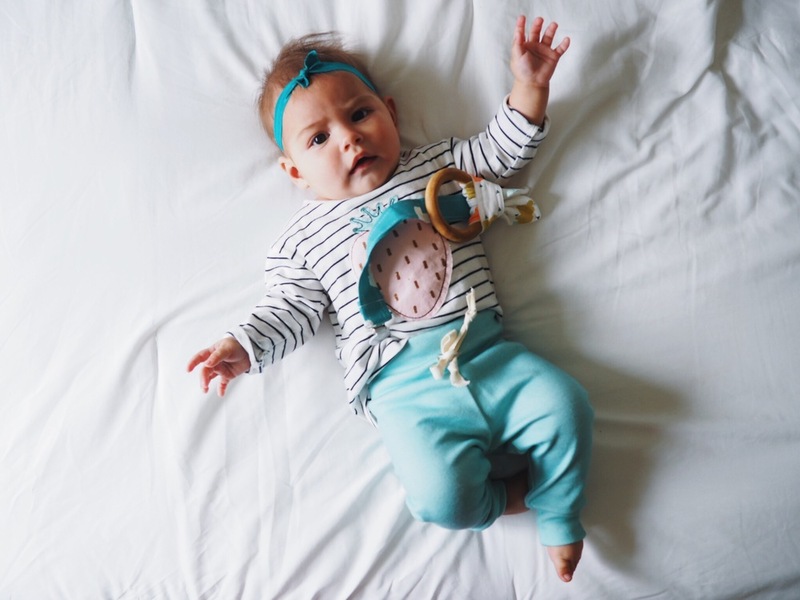 Swell & Solis is a children's brand based in Australia, and we are in love with everything they make. Pictured here is the Dune Romper in baby pink. It's a little big on her so I twisted the straps in the back to make them shorter. I love that it can work in the winter with a long sleeve shirt under, and I cannot wait for her to wear it in the summer to show off those cute toddler legs and back. We also got the White Periwinkle Pinafore, which will look adorable for the summer as well, it's a little too big now. We woke up bright and early because of daylight savings, and found ourselves with so much time before church. So we decided to take Ever to see her beloved airplanes that she loves to watch take off from the airport near our house. Baby Mori is a luxury essentials brand with the softest fabric I have ever felt in my life. Not even exaggerating. The fabric feels like butter and I find myself wishing they made adult sizes. Shown here is the front opening sleepsuit in white and you can see the Mori Muslins as part of Ever's fort. If it rained every day, I would be one happy girl. I've always wanted to live somewhere that it rains a lot, but alas I've chosen to live in two of the most deserty places in the country, Southern Utah and Southern California. But, every now and again my rainy day dreams come true and it makes me want to drink hot chocolate and watch Netflix all day. Instead, I taught my baby barre class, babysat my boss's daughter, then we went to IKEA and Trader Joes, came home, and I'm currently drinking hot chocolate while writing this post and watching Lord of the Rings with my hubby while the babe sleeps. You're never too young to start playing dress up. Or too young to play with dolls. What is it about dolls that draw little girls to them, no matter how old they are? As soon as I opened the box full of Ever's new Shimmer & Shine toys from Kohls, she got so excited and kept playing with the dolls still inside their packaging. It was the cutest thing. And then when I pulled out the music playing microphone, that was a whole different level of excitement. You can find her Dress-Up Trunk here, the microphone here, and the dolls here + here. 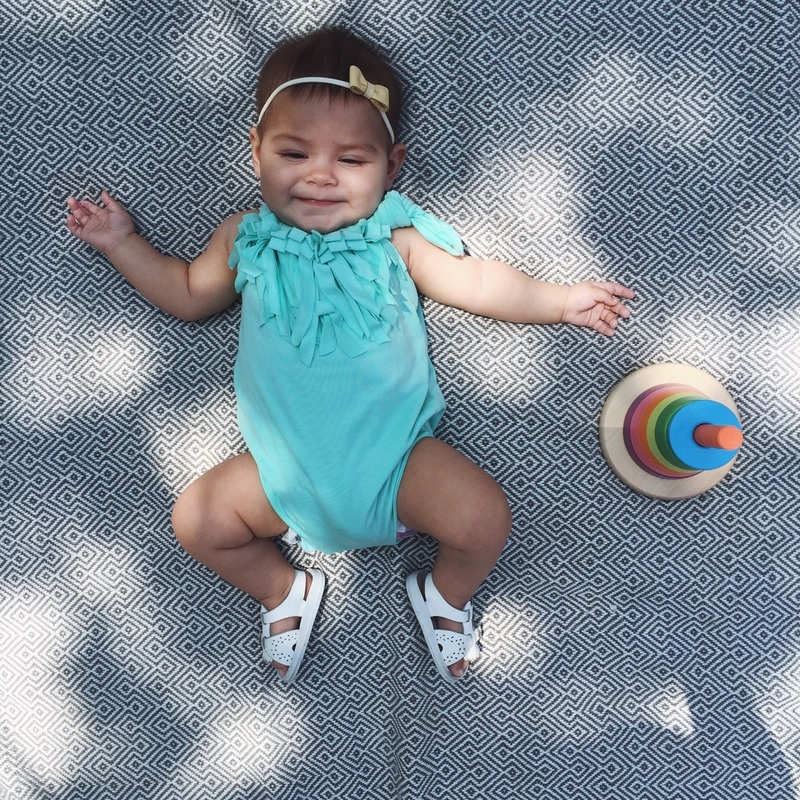 Love Winnie James is an online boutique carrying women and children's apparel. They carry the cutest and trendiest styles, including this amazing floral dress. When I saw this dress it reminded me of gloomy beach days, so naturally we had to take some photos on the beach. I love the floral pattern, the low neck for easy nursing, and that it's so flow and flattering. It's also easy to dress up or dress down. I also got Ever these little oxfords, and they're our new favorite shoes. Mom life. The hardest and best job I've ever had. And even though it's 24/7, I never get a break, and I'm highly underpaid, it's so worth it. This shirt by To: Little Arrows sums it up perfectly. "So cool. So crazy. So worth it. Mom life." "Hold me closer, tiny dancer..."
Yes, the familiar lyrics. But this shirt by Cheerily means something different to me. I'm a dancer. I grew up dancing, majored in dance in college, and now I teach tiny dancers. It's my passion. I always wanted to be a professional dancer, but life happened, and I wouldn't have had it happen any other way. But I miss dancing like crazy, teaching 3 year olds is not really dancing. I miss the feeling when you're throwing your body around the room in ways you never would have imagined possible. You feel so free, so unstoppable, and so beautiful all at the same time. Leia Roux! Oh my goodness, the things she makes are so beyond gorgeous. 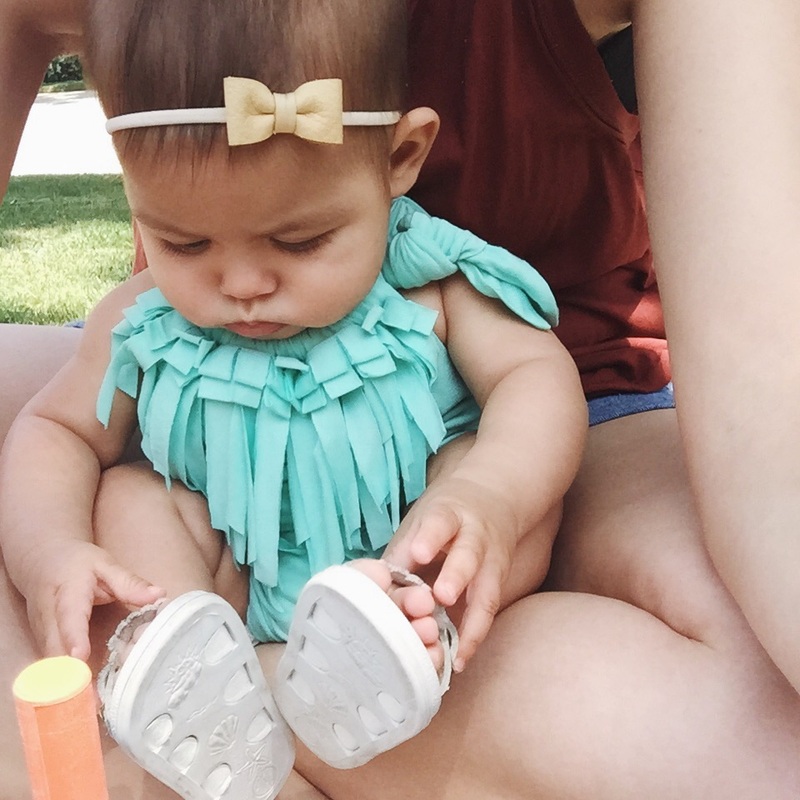 I got Ever this lavender stripe romper and we are in love! The fabric is stretchy, but it doesn't lose its form after a day of wear. 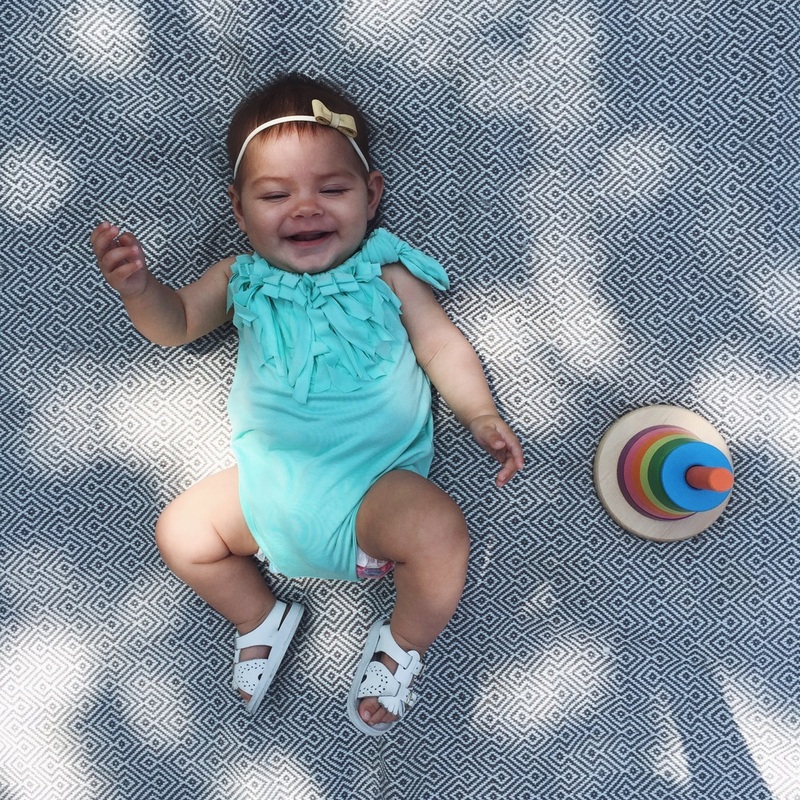 Everly B is a shop dedicated to handmade goodness for mom and baby, with the cutest tees, dresses, and rompers (oh my!). Run by a mama of 3, she knows what a kid needs to be comfortable. Ever is wearing the Criss Cross Playsuit. This fabric is organic, so it's super soft, and I would actually love one in my size but I'm not sure it would look as cute. I basically want everything in her shop, but this little playsuit stuck out to me above everything else. I love the flutter sleeves and criss cross back. So different than many other rompers on the market. "Which stroller should we pick, Evvie?" Okay, I so wish I knew about Gugu Guru when I was pregnant. It would have saved me a lot of stress and confusion. I had no idea what to register for so I registered for EVERYTHING. Actually three of everything, just in case. And I changed my registry about ten times, too. Gugu Guru is a new baby registry website that makes unbiased, personalized product recommendations based on your lifestyle and personal style. Upon signing up, you take a fun quiz to let Gugu Guru know about your lifestyle, the clothing and decor styles you like, and your product preferences. You let them know your style. I obviously gravitate towards COMFORTABLE. I think Ever needs everything seen here. Once you've finished the style quiz, you're going to let them know a little bit about your preferences. And voila! Your preferences are recorded and it takes you to the products. 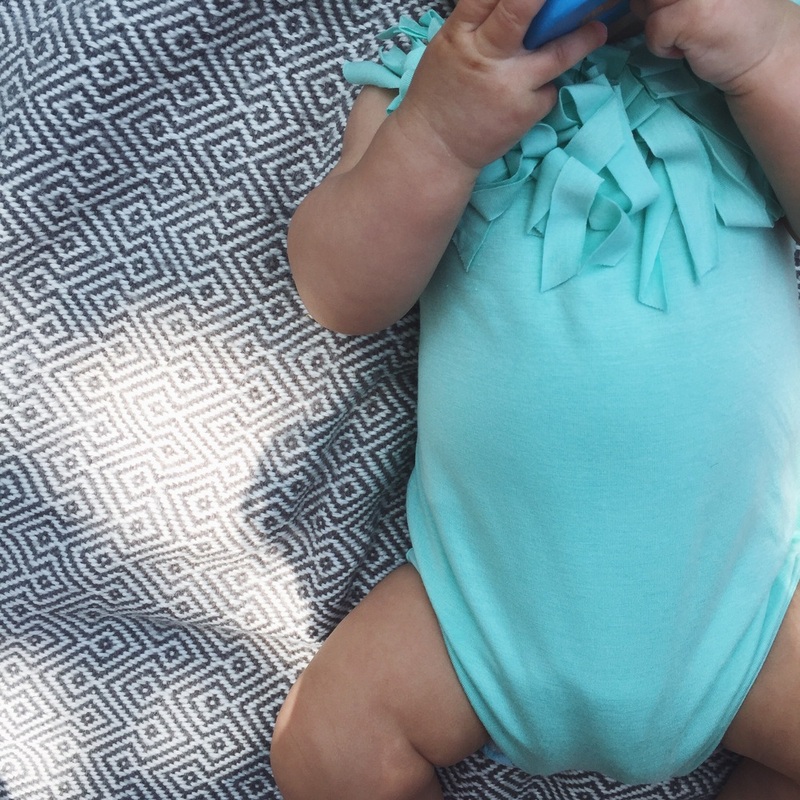 They give you a "perfect match" product recommendation so you can pick and choose to create your own personal baby registry. No searching website after website to find what you're looking for, then adding the link into your registry, Gugu Guru makes suggestions for you and you choose from there. The products they recommend aren't only the top, name brand items, either. They will recommend those classic brands, but also new undiscovered brands and etsy treasures as well. BUT, if they don't happen to have a product that you're dying to have on your registry, there's an option to add the URL yourself. Also, a fun new tool that they added is the Gugu Concierge. This is a personal shopping service where REAL people search high and low for the perfect products for you. I, for one, get so overwhelmed with all the options out there for the simplest things, and who needs any extra stress when you're pregnant? This service takes that burden off your shoulders and places it on a professional burden-holder/personal shopper/lifesaver. And there are 3 different packages you can choose from. Overall, Gugu Guru would have been a lifesaver in my pregnancy. Now that Ever is here, though, I can still send my friends and family the link to my registry when they ask what we still need. As she grows, I'm always coming up with new things that she needs. And instead of stressing myself out by trying to research every detail of every product, I'll let Gugu Guru do the work for me. 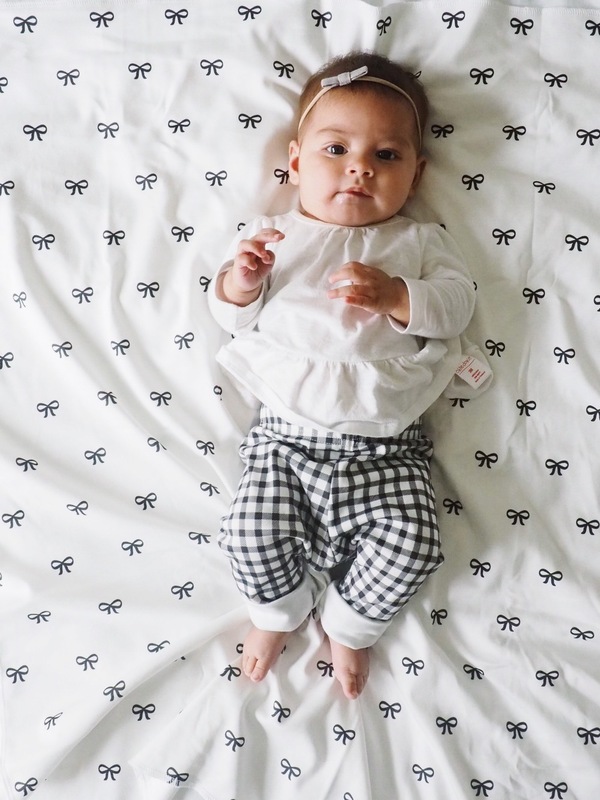 baby threads | Remie Co. This little Fringe Betty by Remie Co. is the epitomy of summer. There's a reason their motto is "we do comfortable", also, because the fabric is butter soft. Everything on their website has me drooling, but I chose this romper because I love this color on Ever and the fringe makes it different than any other brand. And we've gotta show off hose leg rolls, duh. Ever's bow is by Fourth + Pierce. Perfect for a day at the beach, or soaking up the summer sun at the park. Disclaimer: we are not at the park, we are on a patch of grass in our apartment complex. Winnie Winkle is a little handmade shop with the prettiest whimsical pieces. I'm in love with the colors and design of it all. 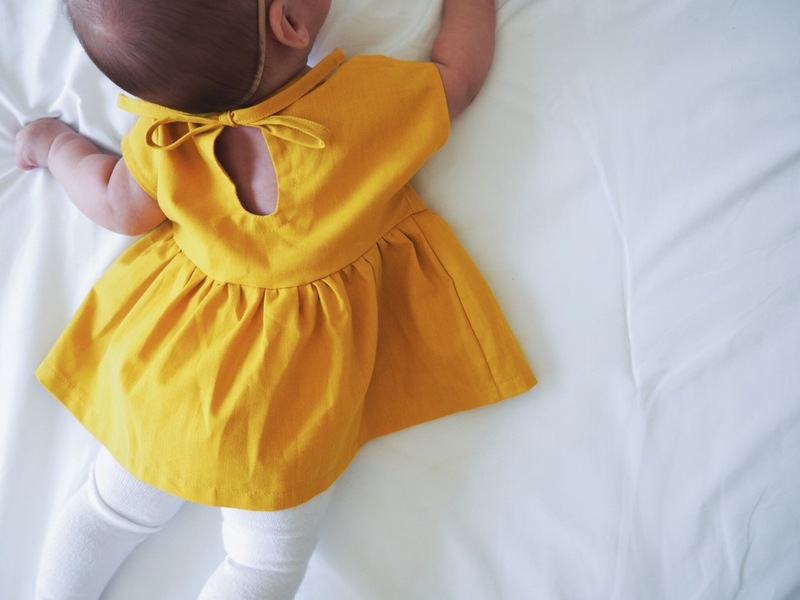 In these photos Ever is wearing the mustard peplum tunic in a 6-12 month so it fits more like a dress right now, and the white dot classic bow. We are in love with everything this cute shop makes. 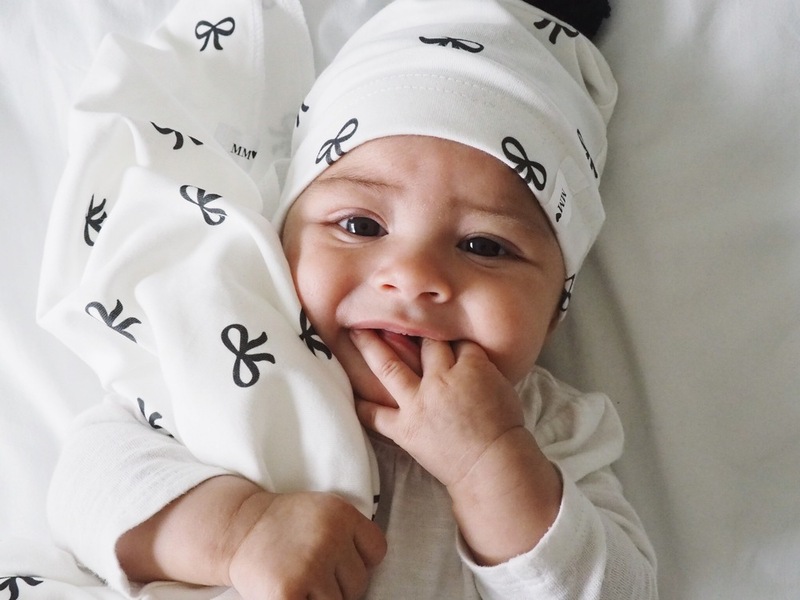 Babysprouts & Co is a modern baby apparel and accessory shop with the softest organic fabrics! They carry all the essentials you'll need for your baby and toddler. And right now they're having a huge sale on discontinued colors and products! From their sale I got all these cute things pictured below. 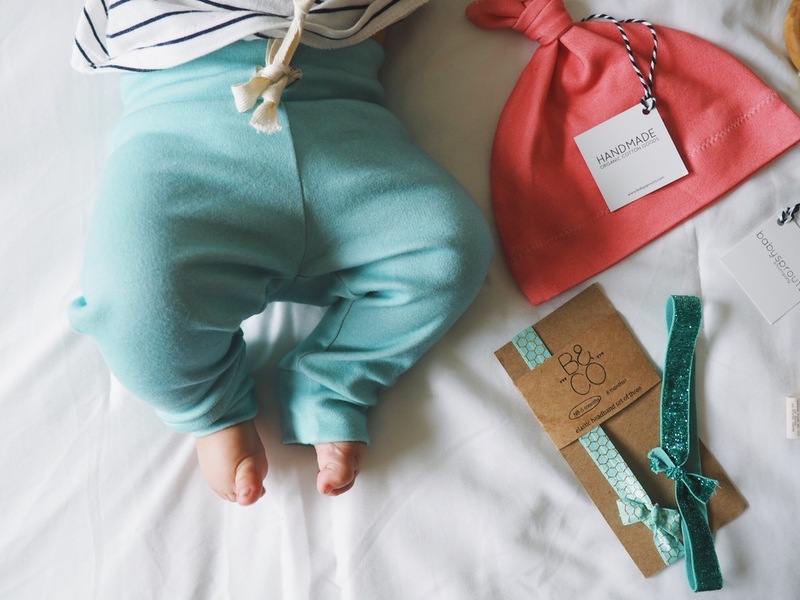 The softest mint leggings, a hat, a bib, teething ring (that Ever LOVES), pacifier clips, and elastic headbands! This Babysprouts teething ring is soaked in beeswax and olive oil for a soft feeling on your baby's sensitive gums. And Ever somehow figured out how to take the fabric off, but she loves playing with that, too! This pacifier clip will ensure your baby's paci is never far away, and never on the dirty ground. And the comfiest little pants. Everything in the Babysprouts shop is such great quality, and made with lots of love for your little. If you're on a budget, click here to shop their close out inventory! And hurry fast before it's gone! We were asked by Mini Style Blog to take photos for their upcoming feature with My Mila, and of course we said "yes" because Mini Style is easily one of my favorite blogs! Here's all the photos we took.